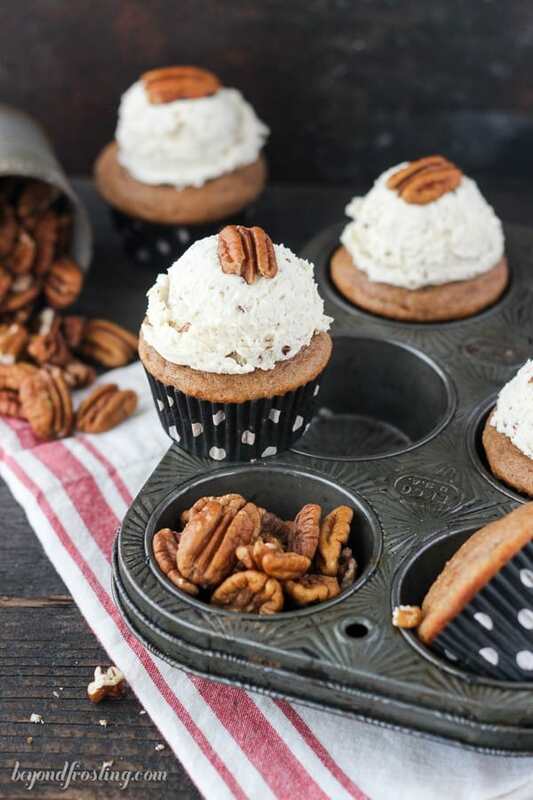 These Maple Pecan Cupcakes are the perfect fall cupcake. 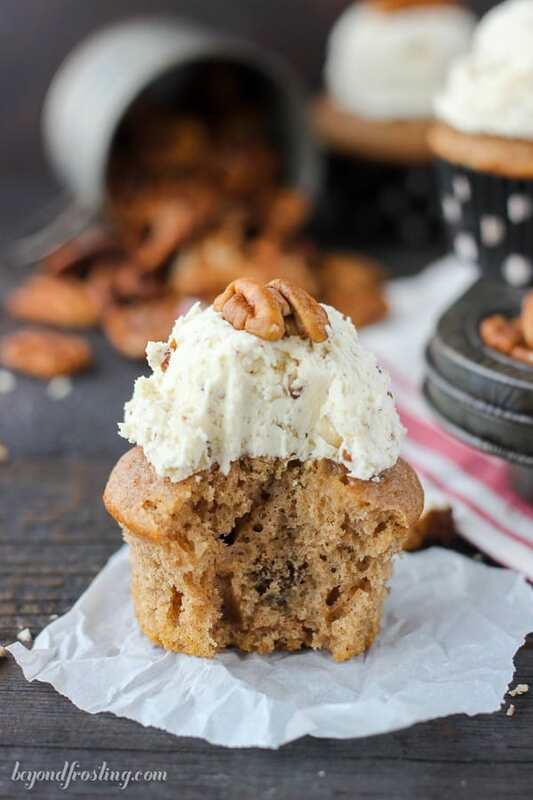 It’s a spiced maple pecan cupcake that is topped with a brown butter pecan frosting. I’ve partnered with Nuts.com to bring you this recipe today. As always, my thoughts and opinions are my own. As the nights get cooler, and it takes longer to warm up during the day, I am reminded with how much I love fall. I think about turning on my oven, mixing up some cake batter and waiting for my house to fill with smell of toasted nuts, cinnamon and brown butter. These flavors make for the perfect cupcake. 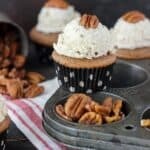 These Maple Pecan Cupcakes are a spiced maple cake with toasted pecans and a brown butter pecan frosting. I think it should be a requirement that all frosting has brown butter in it from now on. This recipe starts with a cake mix, but it’s what inside that makes it special. I’ve added cinnamon & nutmeg, some light brown sugar, Greek yogurt, maple syrup and toasted pecans. I lightly toasted the pecans while the oven was preheating and then chopped them up and threw them in the batter. There’s no shame in using a cake mix, because you can definitely make it your own. The frosting for this recipe start with a similar frosting I used on my Salted Caramel Butterscotch Cake. Then I saw this maple pecan frosting and I knew a combination of the two would be just perfect. In fact, the same coworker who went gaga for that cake took the last 4 cupcakes back to his desk to enjoy the following day. I can’t argue with that! 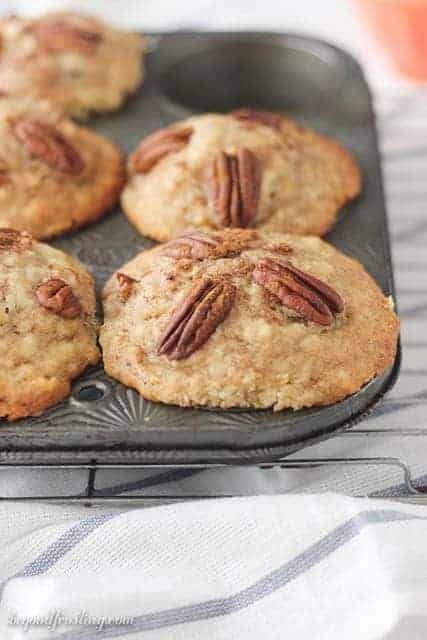 For the frosting, you’ve got a brown butter base-frosting recipe and it’s loaded with toasted pecans, a hint of bourbon and some maple syrup. The bourbon is optional, and I would suggest substituting with heavy whipping cream instead. The secret to using the brown butter in the frosting is to brown it first (while your other butter is softening) and then allow it to cool. First you need to build the base of the frosting with the softened butter and powdered sugar and get it nice and thick before you add the liquid browned butter. 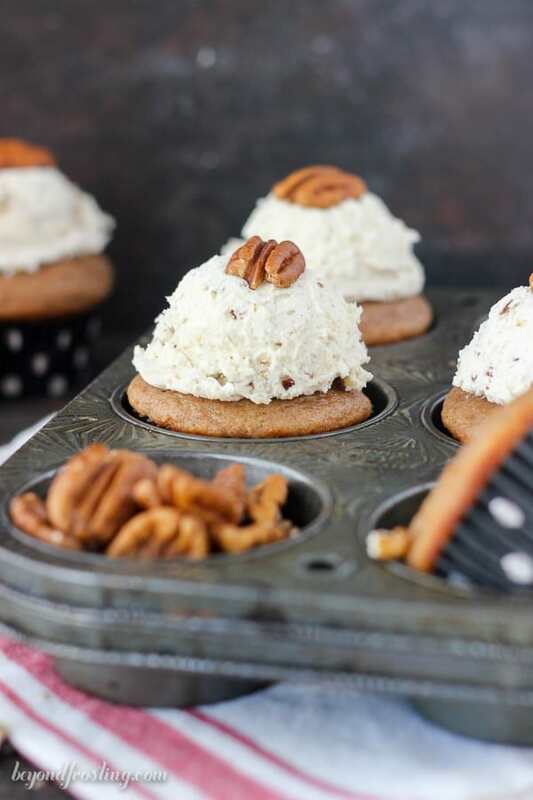 Since this is a chunky frosting, I opted to use a cookie scoop to put the frosting on top of the cupcake and garnished it with a pecan. I love the way the scoop of frosting looks on top. 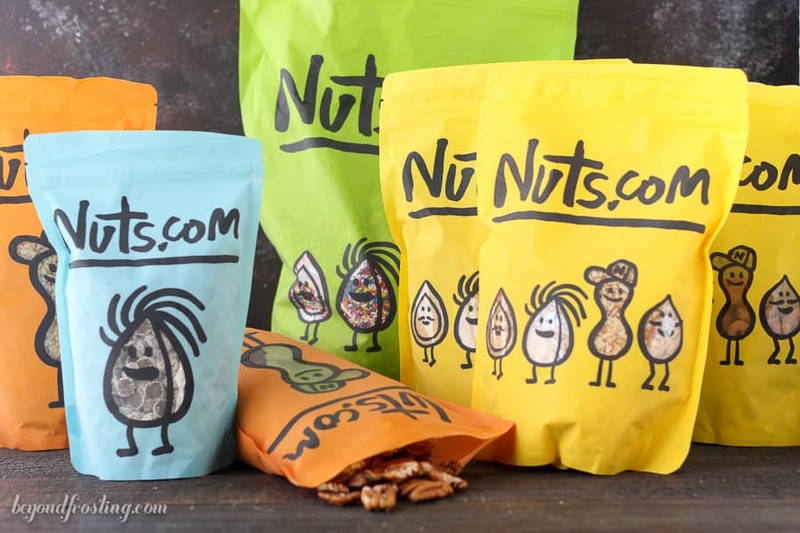 I got a gorgeous bag of pecans from my friends over at nuts.com. I first heard about nuts.com when I was looking for bulk sprinkles. You guys have no idea how many sprinkles I go through in a year! It’s too expensive to buy the smaller jars in the baking aisle, so I sought out somewhere to buy bulk sprinkles. Coming up in October is our annual cookout at the pumpkin patch. I, of course, always make desserts and usually bring some cupcakes, so these cupcakes might just make it into the line up this year. This recipe is sponsored by Nuts.com, all opinions are my own. Thank you for supporting the brands that help support Beyond Frosting. 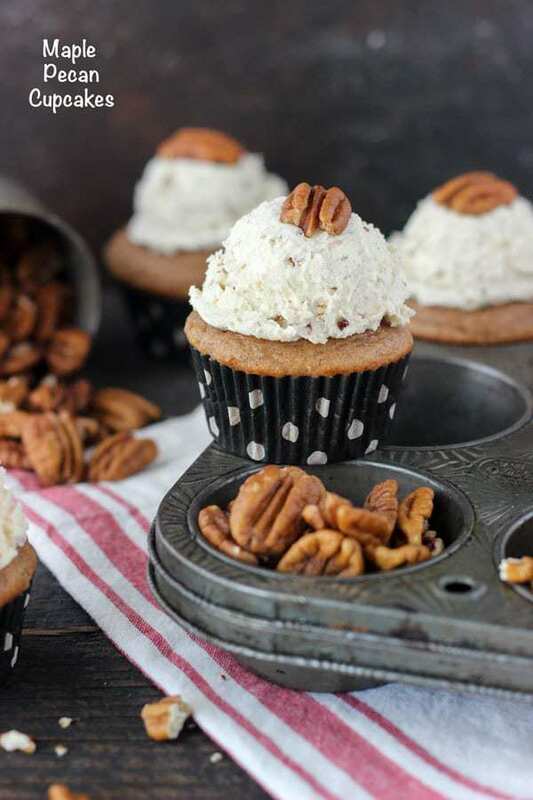 These Maple Pecan Cupcakes are the perfect fall cupcake. 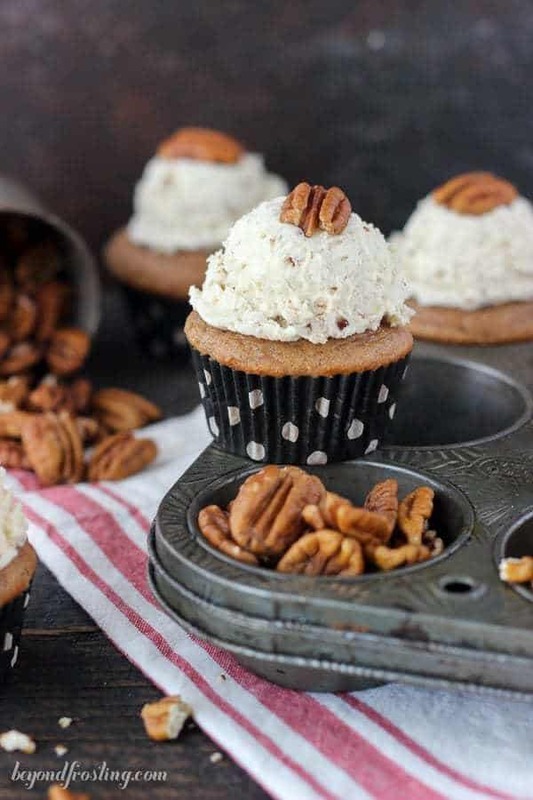 It’s a spiced maple pecan cupcakes are topped with a brown butter pecan frosting. For the cupcake: Preheat the oven to 350° F and line a cupcake pan with paper liners. While the oven is preheating, toast the pecan. Spread the pecans on a baking sheet and toast for up to 10 minutes, until you start to smell the pecans. Set them aside. 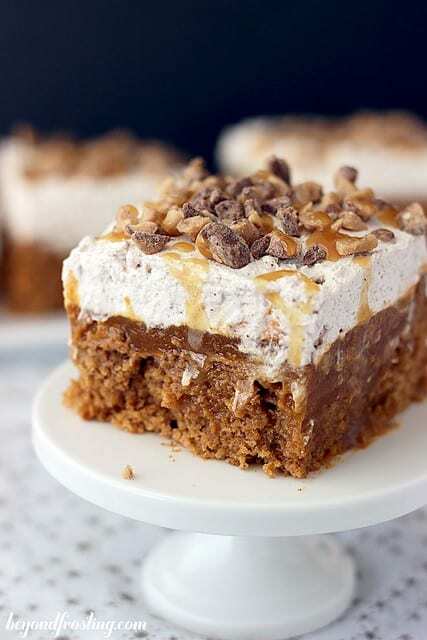 In a large mixing bowl, combine all the remaining ingredients: cake mix, eggs, milk, oil, Greek yogurt, maple syrup, vanilla extract, light brown sugar, cinnamon and nutmeg. Mix all the ingredients together until it’s well combined. Take ½ cup of the toasted pecans and coarsely chop them with a sharp knife. 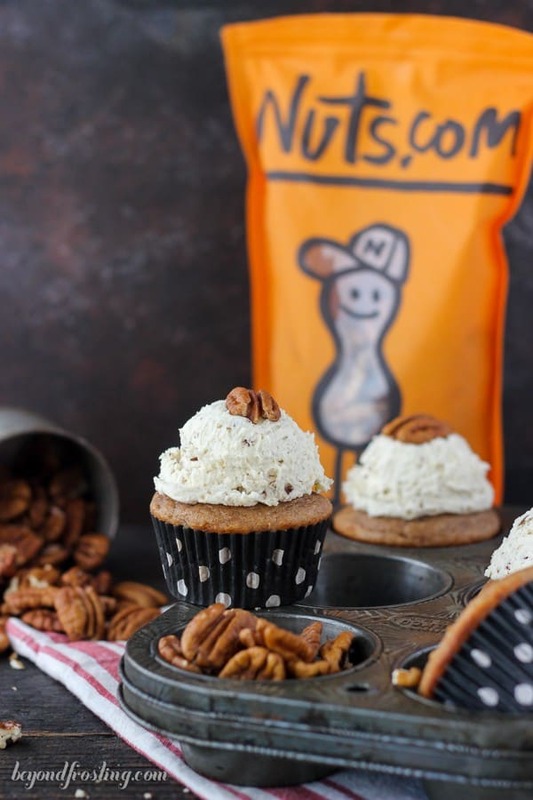 Fold the pecans into the cupcake butter. Divide the batter evenly between cupcake liners, about 3 tablespoons for each cupcake. Bake at 350°F for 14-16 minutes, baking times will vary by oven. 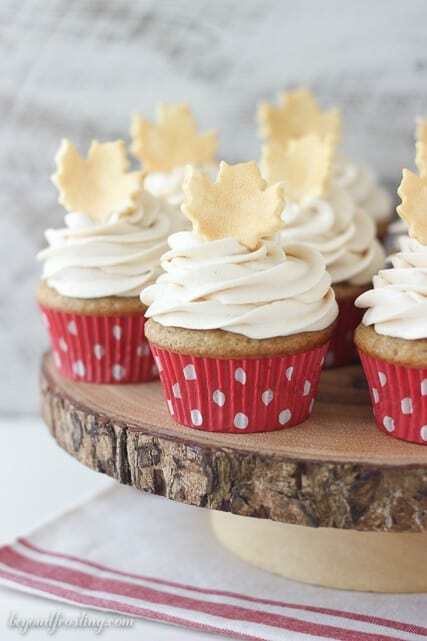 Check the cupcakes for doneness by inserting a toothpick into the center of the cupcake. If the toothpick comes out clean, the cupcakes are done. Allow the cupcakes to cool completely. For the frosting: Remove 3 sticks of butter of the refrigerator, one stick will be browned and the other 2 will be left to soften. To brown the butter, use a small saucepan, and cut the butter into pieces. Melt the butter over medium heat and allow it to boil and bubble. Once it’s stops boiling, stir it frequently and it slowly starts to turn an amber color and releases a nutty aroma. Remove the butter from the heat and allow it to cool. Cut the remaining butter into pieces. Using the paddle attachment, whip the butter for 3-4 minutes, scraping down the bowl occasionally. Beat until butter looks light in color. Add 4 cups powdered sugar, one cup at a time and mix on low speed until incorporated into butter. Add the maple syrup and bourbon and continuing beating. Next , add 1 cups of powdered sugar and slowly pour the cooled brown butter into the frosting and beat it into the butter until the frosting is completely smooth. Add the last cup of powdered sugar and a pinch of salt and beat on low speed until the cream is incorporated. Then beat it at a high speed for 1 minute to whip some additional air into the frosting. Take the remaining toasted pecans and finely chop them with a nut grinder or a sharp knife. Add the pecans to the frosting and mix them until they are incorporated. Take a large cookie scoop (3 tablespoons size) and scoop the frosting onto the cupcakes. Place a whole pecan on top. 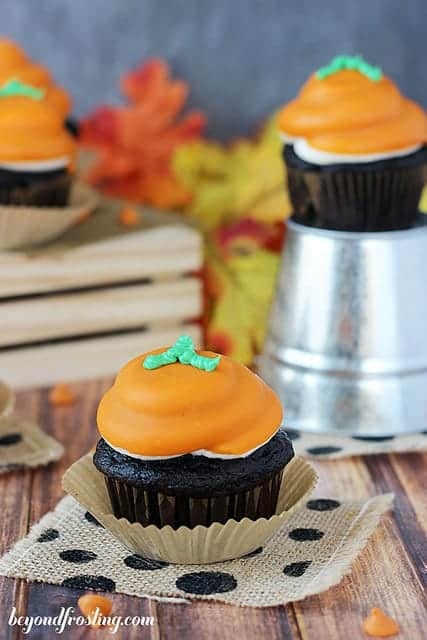 Visit Beyond Frosting’s profile on Pinterest. Going to try these, but hopefully I’ll be successful subbing a home-made box mix recipe I found instead. I hate using box mixes and prefer it all to be from scratch. Hi Liz, that sounds wonderful! I hope you like them. I can’t get over that big amazing scoop of frosting!